Broadcast on radio4 on 9th January 2009 at 11am. Well sadly, this show is one of the very few that can't be listened to again on the BBC website. Tcha! I only heard half of it too! What I heard of it I enjoyed: Mr Adams made a well structured plan of what he wanted to do: travel to Moscow to see how Judo is taught there in order to help him set up a dedicated facility on Wales to cater for judo which Mr Adams deems essential for the sport. As a sideline he wanted to meet one of Russia's famous judo exponents and also one reason for the resurgence of the sport in that country, non other than Vladimir Putin. 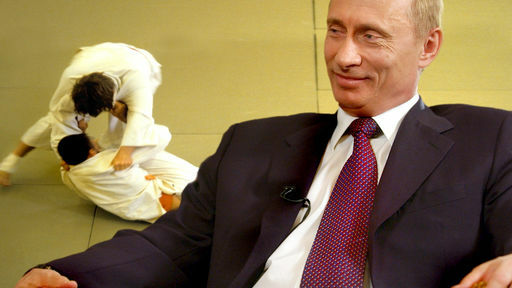 The first part of the programme (the bit that I caught) had an interview with Mr Adams and a biographer of Putin who outlined how he thought judo had an impact on Putin's character (he derived this through interviews with the Russian leader). He spoke of the fact that Putin is small and in judo needs to use canny thinking and intelligent use of levers to win matches, not brute force. The biographer then went on to draw parallels with the Georgia incursion which I thought weird as this seemed rather heavy-handed to me! I guess it depends on whether you think the Georgian conflict was staged by the US as Putin himself claims. I digress. The radio show sounded great, apart from some cheesily voiced Kano quotes, and I'm sad to have missed the end. I met Neil Adams some time ago at a Judo workshop where I was demo-ing Tang Soo Do for some school children. I was pleased to be able to join in with some of the sessions and was tutored a little by him. I remember seeing his feet and being struck by how much I thought that they seemed articulated like hands! they could move in lots of different ways that my feet couldn't begin to try. Natural I suppose from a Judo Olympian. He seemed friendly and approachable but a little detached after he'd finished teaching. He did join in with our breaking demo (the kids always love some flying side kick breaks) and that was good of him. Good luck Neil Adams with the dedicated facility and good luck Wales! Was Elvis really any good at karate?